Plans for a new hotel and public square on landmark Birmingham city centre site Arena Central are a step closer after a planning application was submitted. Centre Island Birmingham has submitted proposals for a 210-bedroom Holiday Inn Express hotel on the Arena Central site, fronting Holliday Street and adjoining the Crowne Plaza hotel. The site, previously home to Central Television off Broad Street, has been subject to a number of major plans in recent years, but has been dogged by the economic downturn. The plans, and updated masterplan, have been submitted to Birmingham City Council after a conditional sale of the site to Centre Island, which owns the Crowne Plaza. They include a 14-storey development with the hotel on upper levels and a separate 10,000 sq ft stand-alone health club, swimming pool, spa and atrium link to the adjacent Crowne Plaza Hotel on the lower levels. The masterplan has been updated to reflect positioning of the new hotel and the revised outline planning permission received last year increasing the maximum office content from up to 400,000 sq ft to up to up to 800,000 sq ft.
Jonathan Wallis, development director of Miller Developments, said Arena Central was the only site in the city centre capable of delivering large buildings with floor plates of over 20,000 sq ft. He said: “Arena Central is one of Birmingham’s most strategically located regeneration schemes and the inclusion of this Holiday Inn Express will provide a considerable boost to the city’s burgeoning hotel market. Arena Central is a 7.6-acre regeneration site at the heart of Birmingham city centre and forms a significant part of Birmingham’s vision for the city’s Westside, as set out in the Big City Plan. The latest application comes with an amendment to the masterplan for the area bordered by Suffolk Street Queensway, Broad Street, Bridge Street and Holiday Street. 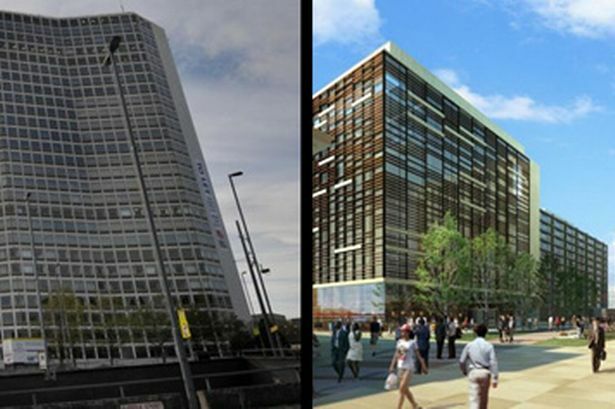 The initial phase of demolition on the site has been completed, cementing its position as the city centre’s largest consented and deliverable office scheme. Outline planning consent for Arena Central is already in place for up to 2.3 million sq ft of mixed-use development including up to 800,000 sq ft of office accommodation, hotels, residential units of over 200,000 sq ft alongside up to 1.2 million sq ft of retail or leisure units. The nature of plans for the site has changed over the past decade, as the collapse of the buy-to-let market resulted in a re-think, with fewer apartments and more offices. Mark Foster, managing director of Centre Island, said: “With the recent news that Birmingham’s hotel market is demonstrating growth in occupancy, this is the perfect time for us to confirm our commitment to delivering a new hotel within the city centre. Developers have set a target date to start on site in June 2013, with the hotel to open by January 2015. The development will include the demolition of the old multi storey car park at the junction of Holliday Street and Bridge Street and the completion of the demolition of the old retail units fronting Alpha Plaza.